Review the links on this website that enable students to gain a more thorough understanding of alternative energy innovation for cars. 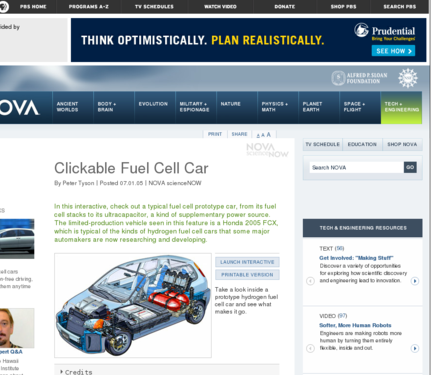 The interactive format explains the various components of the fuel cell prototype car. A detailed explanation of how a hydrogen fuel cell works accompanies the interactive. As this technology is continuously developing, check for up-to-date resources when teaching this topic. There are a variety of useful links that teachers can use to build a unit on alternative fuels and cars. Areas to click on are clearly identified. Some areas provide additional links to further information on the topic.